← Whispering Web – The Book. Roundabout-phobia: the psychology and the sociology. I confess, my ecologic foot print could be lower. After all I drive from my place to the office and back almost every day. I’ve done that for quite a while now but never realized I met 8 roundabouts. Until recently when the driver in front of me seemed afraid to simply enter the circle. As this happened over and over at each roundabout, I started thinking. The ride seemed endless. Plenty of time to think. I started wondering whether this lists on any disorder list. I guessed it would take us too far to officially list roundabout-phobia on DSM (Diagnostic and Statistical Manual of Mental Disorders). 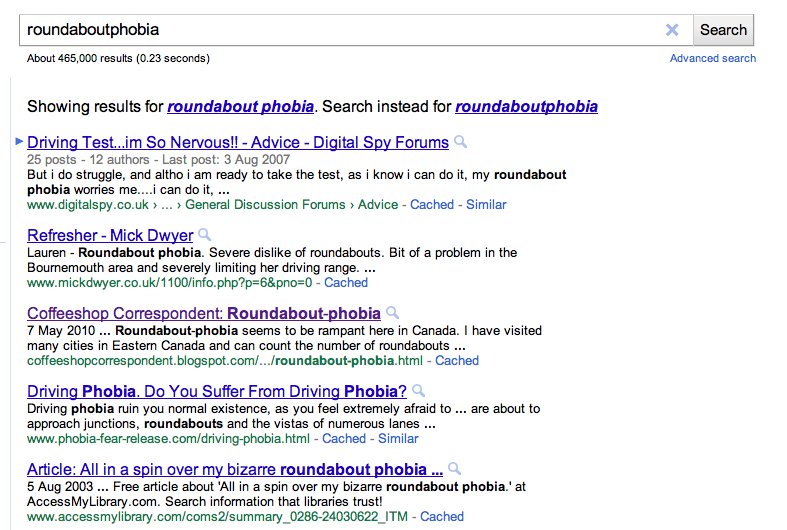 When I finally arrived at home, I opened up my laptop and Googled “roundaboutphobia”. These were the results. I went for the third link, a story from the “Coffeeshop Correspondent” about “roundabout-phobia”. My Google research was to find out whether the phenomenon was known by psychologist. I looked at it as a disorder. The Coffeeshop Correspondent digged up a completely different view: a sociological, cultural one. Roundabout-phobia seems to be rampant here in Canada.I have visited many cities in Eastern Canada and can count the number of roundabouts (traffic circles) on one hand. This is roughly the same number as can be found in any ONE populated center in the UK. Kudos to Oromocto for their forward thinking in recently building one of their own. The Coffeeshop Correspondent was a completely different view. Roundabouts are a cultural thing. Some cultures love them – others start to see the benefits just now. The correspondent beautifully embeds this in an urban development / spatial planning policy making debate. But what happens if an American visits Europe, hires a car to tour around and then suddenly drives up to a roundabout for the first time? Right. The experience might be similar to a continental visiting the UK with his own car and the ferry. Maybe that day I drove behind a north-american visiting Europe. Yes, I recall the car having a Hertz Car Hire sticker. Love how psychology and sociology intertwine? No: get me out of here and make sure I never end up here again. 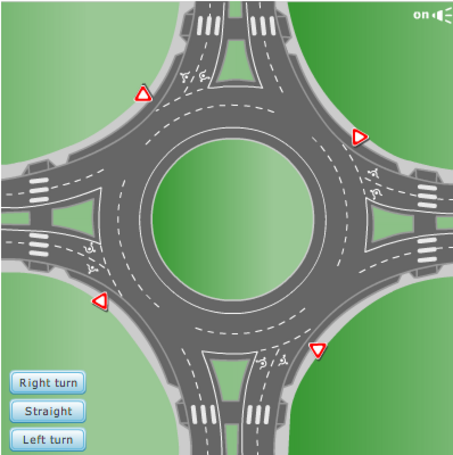 One Response to Roundabout-phobia: the psychology and the sociology.